I recently got into a conversation with an older, intelligent woman who claimed to be a Christian. As we were talking, the topics of faith and sinful lifestyles were brought up. The woman kept shaking her head at me, saying how there couldn’t be a loving God who would judge us so harshly on our fleshly tendencies. I really wasn’t exactly sure how to respond at first. I knew that God is indeed loving, but that He is also just. We must try to overcome our sinful nature on our walk with God. I also mentioned that I couldn’t really judge another person’s sinful lifestyle, as I had my own temptations and sins to worry about. The more time I spent alone, the more I started to think about this topic. It doesn’t seem fair does it? There are just some things I would really like to do/say/think that God doesn’t like. Why does He want us to be so miserable? After all, He created us this way. The thing is, God doesn’t want us to be miserable. He wants us to be holy–like Him. And since the fall of Adam and Eve and the sin that entered the world, us humans have a hard time understanding what is truly holy. We have an even harder time trying to desire what is holy. To all of you who are bummed out by God’s expectations–to all of you who may be turned off to Christianity because of your current life situation–I get it. There are changes I have had to make in my life, and there are still things that I am working on. It isn’t always easy, and sometimes I really don’t want to. So why do I bother? I bother because I love God so much that I want to please Him more than I want to please my own flesh. Sometimes I waver and fail (aka sin), but my heart really is set on Jesus, so I am quick to repent. I know that no matter what I am loved by God and saved by the blood of His Son Jesus, but a guaranteed ticket to heaven is not where the story ends. We can have the holy and beautiful life that God has in store for us starting now if we submit to His word. 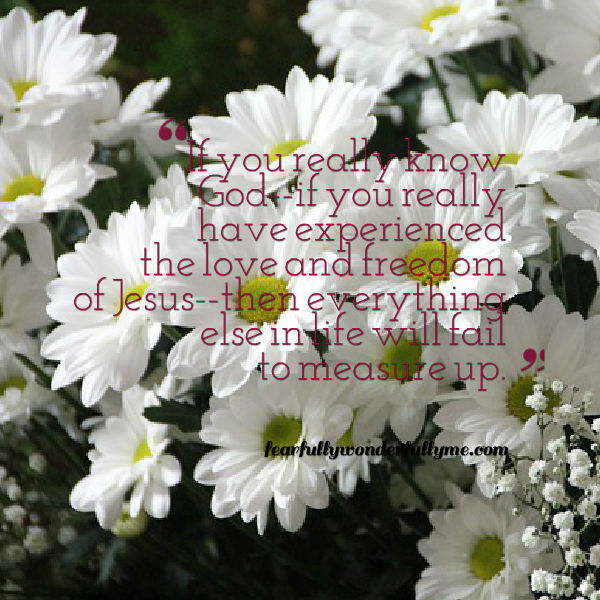 If you really know God–if you really have experienced the love and freedom of Jesus–then everything else in life will fail to measure up. Even the people and things we love most will hold second place to God (even though they can still matter). Even so faith, if it hath not works, is dead, being alone (James 2:17 KJV). You can tell who is a true follower of Jesus by how the Holy Spirit is working in their life. A true Christian will not live the same way as everyone else. We will not watch the same movies, listen to all of the same music, or say the same things. I see this in my own life every day. I used to watch a show on T.V. that I thought was funny. I recently was flipping through the channels to find re-runs of it playing. It was so vulgar and raunchy that I had to change the channel. Not only did I not find it funny anymore, but I truly did not want it. Obviously I am not perfect here, and I still watch mainstream shows. It’s just that I am more careful with my choices. Still, some things are harder to give up. Sometimes it can even take time and maybe some extra help from older Christians or professionals. But I know that I want everything in my life, including the decisions I make, to glorify God. Every time we choose God over this world, we get to experience the full joy of God’s presence. We also get to live the life He wants us to have. A lot of us will nod our heads and say “amen” to this. Here’s a question for you ladies: Will you give up that super cute and charming boyfriend who isn’t a mature Christian for God? It can be hard, but if you truly love God and know how much He loves you, then you will become convicted of the things in your life that you need to change. Spiritual maturity and growth takes time, but it’s worth it. Even though giving up some of our fleshly ways isn’t fun in the beginning, if we have faith and keep persevering, we will reap the rewards. And let us not grow weary while doing good, for in due season we shall reap if we do not lose heart (Galatians 6:9 NKJV).